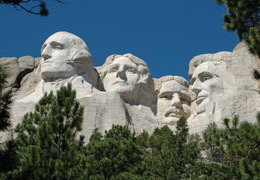 Every year, the many visitors to Mount Rushmore National Memorial in the Black Hills of South Dakota draw inspiration from the colossal portraits of four outstanding presidents of the United States: George Washington, Thomas Jefferson, Abraham Lincoln, and Theodore Roosevelt. Gutzon Borglum carved his gigantic Shrine of Democracy Sculpture into ancient granite high on the southeast face of Mount Rushmore “in commemoration of the foundation, preservation, and continental expansion of the United States.” The faces of George Washington, Thomas Jefferson, Abraham Lincoln, and Theodore Roosevelt are about 60 feet high, and the grouping extends approximately 185 feet along the crest of Mount Rushmore. Dark ponderosa pines and other evergreens set off the stark white sculpture. Added at the time of the Bicentennial of the Declaration of Independence in 1976, a flag-lined formal Avenue of Flags creates an impressive approach. In 1923, South Dakota State Historian Doane Robinson came up with an idea for attracting tourists to the State. Robinson envisioned shaping a cluster of tall thin granite peaks called the Needles into statues of explorers and Indian leaders. The Needles stand where the Black Hills rise from the plains as a gateway to the Rocky Mountains and the West. In 1924, Robinson wrote sculptor Gutzon Borglum about his idea. Borglum telegraphed back his enthusiastic support. Born to a Danish American family on a homestead in Idaho in 1867, Gutzon Borglum made his name celebrating things American in a big way. In 1908, he created a large, 40 inches-high head of Abraham Lincoln. Representatives of the United Daughters of the Confederacy soon contacted him about creating a portrait head of Robert E. Lee on the side of Stone Mountain in Georgia. Convinced that the scale of the mountain would dwarf a single head, he convinced them to create a huge group portrait of General Lee, Stonewall Jackson, and Jefferson Davis. Borglum completed the head of Lee in 1924, but a dispute with the backers of the project soon led to his dismissal and the eventual removal of his work. His departure from Georgia made it possible for him to concentrate on Mount Rushmore. Borglum scouted out a location far better than the fragile Needles: 5,725-foot Mount Rushmore. Its broad wall of exposed granite was more suitable for sculpture and received direct sunlight for most of the day. Borglum himself selected the presidents for the memorial, to reflect the nation’s first 150 years of history and to make the project a national, rather than regional one. Original plans included only George Washington and Abraham Lincoln. Borglum picked George Washington the father of the new country because he was a leader in the American Revolution, the first president of the United States, and the man who laid the foundation of American democracy. Abraham Lincoln was selected for preserving the Union during the Civil War and abolishment of slavery. As the project progressed, Borglum added Thomas Jefferson and Theodore Roosevelt. Jefferson, the author of the Declaration of Independence, began America’s westward expansion by purchasing the Louisiana Territory from France in 1803, which doubled the size of the country, adding all or part of 15 present-day States. Theodore Roosevelt, 26th president of the United States and extremely popular in the early 20th century, linked the east and the west through the construction of the Panama Canal and was famous as a “trust buster,” fighting large corporate monopolies and championing the working man. Initial planning and fund-raising began in August 1925. The project was almost out of money in 1927 before carving even began. Borglum and the planners succeeded in getting the support of President Coolidge when he was vacationing in the Black Hills. Coolidge dedicated the memorial in 1927. In the closing days of his term in office, he signed a bill approving matching funds. The Federal Government would eventually cover almost all of the almost million-dollar cost of construction. On October 4, 1927, the carving process began. Local gold miners carefully removed rock from the mountain using small charges of dynamite, leaving a three to six inch layer of granite. They used 75-pound jackhammers to remove the next layer and then the carvers took over. First, they drilled a series of shallow holes and then removed the area between them, often by hand. Hand tools smoothed the stone and added small details, like wrinkles and moles. Four hundred people worked on the project. Frequently suspended because of bad weather and money problems, the work was dangerous, but miraculously there were no fatal accidents. During the Depression, it was welcome relief work for many, and for many others it came to be a labor of love. As “Red” Anderson said, "more and more we sensed that we were creating a truly great thing." The dedication of George Washington took place on July 4, 1930. The stone at the original location for the Thomas Jefferson carving turned out to have a detrimental crack requiring its blasting off after two years of work. President Franklin D. Roosevelt attended the dedication of the Jefferson portrait in its present location in 1936. He was so inspired that he gave an impromptu speech. Dedications for Lincoln and Theodore Roosevelt took place in 1937 and 1939. Work on the massive sculpture continued until October 1941. Borglum did not live to see it completed; he died in March 1941. Lincoln Borglum finished the work after his father’s sudden death, but the official dedication of the Mount Rushmore National Memorial did not come until 1991, 67 years after Doane Robinson first had the idea. Somewhat surprisingly, Borglum did not think visitors would understand his work without words to explain it. Initially he planned to carve an inscribed tablet on the side of the mountain next to the head of Washington. When he moved the portrait of Jefferson to the planned location of the tablet, he decided to build a huge Hall of Records behind the presidential grouping. Difficult working conditions and lack of funding led to the abandonment of that project. On August 9, 1998, the National Park Service placed a repository of records in the floor of the hall entry. A teakwood box inside a titanium vault covered by a granite capstone contains 16 porcelain enamel panels. Inscriptions on the panels explain the story of how Mount Rushmore came to be, who carved it, the reasons for selecting the four presidents depicted on the mountain, a short history of the United States, and a copy of the Declaration of Independence. Visitors cannot see this repository. It is a message for people of the future, so that they may understand the meaning and the people behind this great monument. The idea of building the memorial was and to some extent still is controversial because the Black Hills, or Paha Sapa, are the homelands of the Lakota, Nakota and Dakota, among other American Indian tribal nations, and they consider the Black Hills a sacred area. The Lakota Sioux tribe opposed the sculpture as desecrating one of their sacred places. In 1939, Lakota Chief Henry Standing Bear asked Korscak Ziolkowski, a sculptor who worked with Borglum briefly before leaving after a fight with his son, to begin work on a huge freestanding sculpture of Lakota Chief Crazy Horse on a mountain 17 miles from Mount Rushmore. Ziolkowski died in 1982, but the work went on with the completion and dedication of the face of Crazy Horse in 1998. Very different from Mount Rushmore, it too is impressive. Mount Rushmore National Memorial, a unit of the National Park System, is located 25 miles southwest of Rapid City, SD via U.S. 16. Click here for the National Register of Historic Places file: text and photos. The Information Center and the Lincoln Borglum Museum (named in honor of Gutzon Borglum’s son) are open from 8:00am to 5:00pm October 1-May 23; from 8:00am to 10:00pm May 24-August 14; from 8:00am to 9:00pm August 15-September 30. These times are subject to change from year to year. Visits should begin at the Information Center. The Lincoln Borglum Museum has exhibits on the carving of Mount Rushmore, two 13-minute films, an information desk, restrooms, and a bookstore. The Sculptor’s Studio, closed in the winter, displays models and tools used in the carving process. 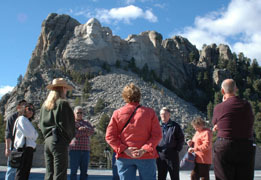 The half-mile Presidential Trail begins at the Grand View Terrace and provides access to viewing sites below the faces. There is no admission fee to the park; there is a charge for parking. 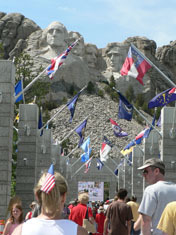 For more information, visit the National Park Service Mount Rushmore National Memorial website or call 605-574-2523, for recorded information, and park headquarters. A map of both the site and the region are available on the website. The website also provides in depth information on the people responsible for completing this monumental project.